Apologies for the poor screenshots – I didn’t have any good ones taken with Fraps before I changed the outfit again, and from the jaggies on these captures, it looks like anti-aliasing was turned off. 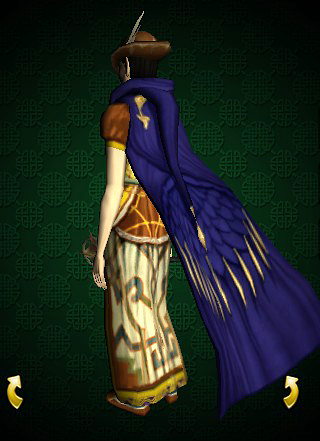 At any rate, between the Anniversary and Spring Festivals in April and May, I picked up a number of new cosmetics – including the awesome Cloak of the Dove – and decided to make festival outfits for a few characters. They turned out to be quite simple, using only two or three pieces each, since the dresses hide any gloves, leggings, and boots anyway. This is Miraear’s. 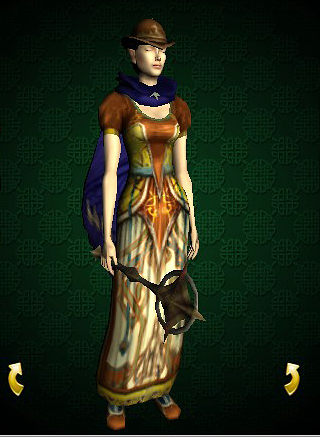 This entry was posted on 2014.06.22 by vyh in Outfits and tagged blue, cosmetics, dress, ered luin blue, festival, lord of the rings online, lotro, minstrel, miraear, orange, outfits.